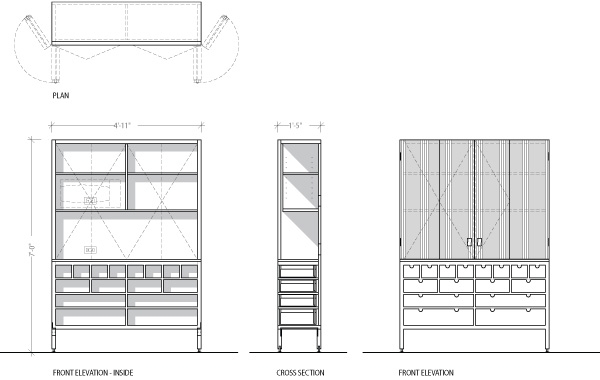 One of the pieces that best embodies the collaborative spirit of Hudson Woods is our custom built kitchen pantry. Conceived and designed by the Lang Architecture team, the construction, material sourcing and craftsmanship is done in conjunction with one of our maker partners, Sam Moyer. The piece is designed to nestle into the great room as an extension to the kitchen. It has built in electrical outlets, storage for small appliances and three drawer sizes to accommodate various needs. The pantry is built from solid black walnut, soapstone countertop and brass accents. Sam sources the wood from ethically harvested lumbar yards and the soapstone from a local stone yard. The boards are hand selected by Sam and arranged intentionally to create a cohesive piece, highlighting natural characteristics of the wood and celebrating its imperfections. The wood batten strips on the doors are hand cut and nailed to create seamless bi-fold doors while adding texture and depth. The drawers are made with a touch of traditional craftsman quality, using hand cut dovetail joinery and in-set grooves for smoother sliding, better durability and greater longevity. The leather door pulls are a custom touch conceived by Sam to compliment the custom in-laid brass details. Working with craftspeople who share our values helps bring the spirit of the Hudson Valley into the homes and the kitchen pantry in particular allows home owners to invest in a piece of custom heirloom furniture.